In some cases, your Norton product blocks some of the benign activities similar to an attack. You may receive repeated notifications to restart your computer. If you know that the attacks that trigger these notifications are safe, you can turn off Norton temporarily for a specified duration. 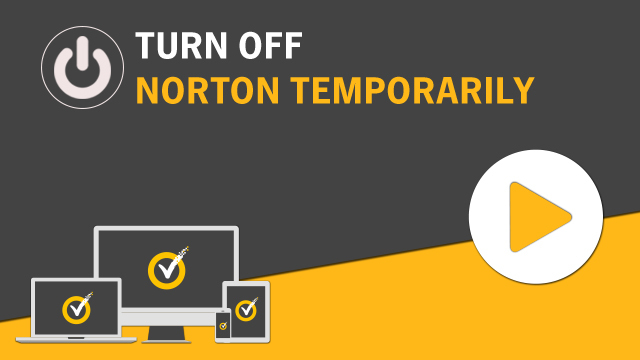 Turning off Norton leaves your computer vulnerable to attacks. In the notification area on the taskbar, right-click the Norton icon, and then click Disable Auto-Protect. In the Security Request window, in the Select the duration drop-down list, select the duration for which you want to turn off Norton. Norton is turned on automatically after the duration you specify in the Security Request window. To turn on Norton manually, in the notification area on the taskbar, right-click the Norton icon, and then click Enable Auto-Protect. In the Norton Task Notification row, move the On/Off switch to Off.